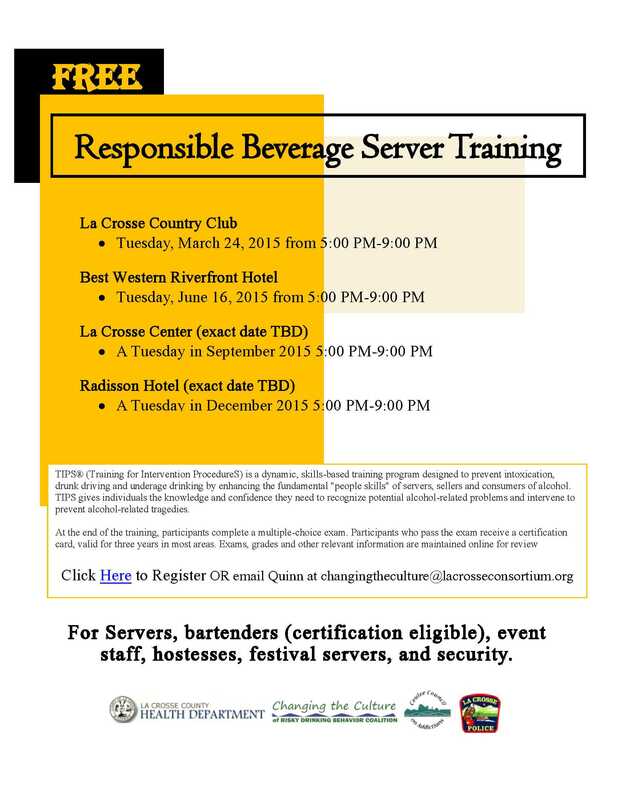 The La Crosse Police Department, together with the La Crosse County Health Department, Changing the Culture of Risky Drinking Behavior Coalition, and Coulee Council on Addictions, are co-sponsoring several FREE Responsible Beverage Server Training sessions throughout this year. The main purpose of the Responsible Beverage Server Training is to help servers and staff create a safe and responsible environment wherever alcohol is sold, served, or consumed. Because servers often create brief, but important relationships with their customers, this training will help them to develop the skills and confidence necessary to ensure that alcohol is being sold, served, and consumed responsibly and legally. 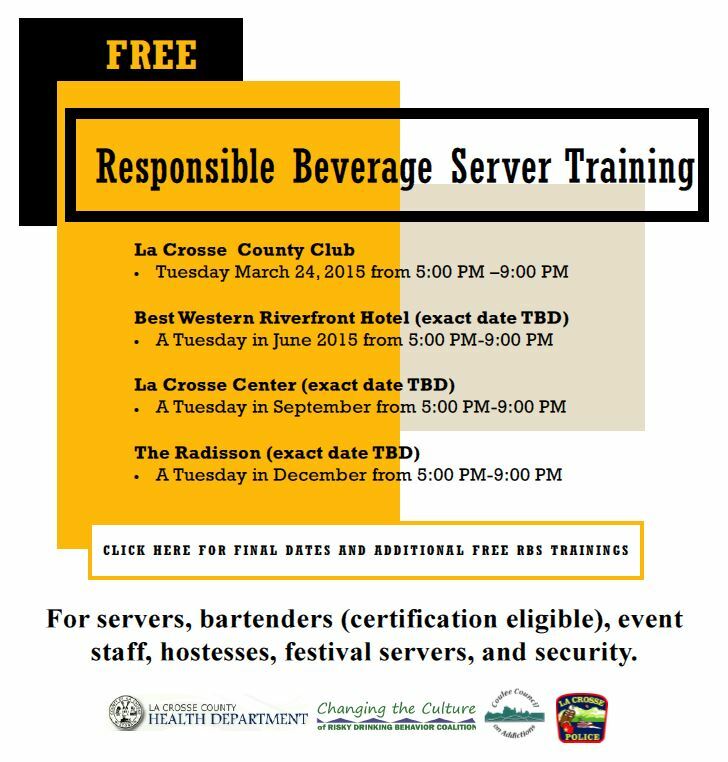 The first Responsible Beverage Server Training session will occur Tuesday, March 24th from 5:00 – 9:00 PM at the La Crosse Country Club, 300 Marcou Rd, Onalaska, WI 54650. The second session will be held June 16th from 5:00 – 9:00 PM at the Best Western Riverfront Hotel at 1835 Rose St, La Crosse, WI 54603. The training is open to servers, bartenders, event staff, hostesses, festival servers, and security staff. At the end of the training, participants that pass the provided exam will receive a certification card. To reserve your seat for either of these sessions, click here or email your name and telephone number to Quinn at changingtheculture@lacrosseconsortium.org. Other sessions are being planned for September at the La Crosse Center and December at The Radisson. Each of these sessions will likely occur on a Tuesday from 5:00-9:00PM. Please visit the La Crosse Medical Health Science Consortium for updated information in the near future.